We’d love your help. Let us know what’s wrong with this preview of Songbirds Are Free by P.M. Terrell. To ask other readers questions about Songbirds Are Free, please sign up. Close your eyes, take a deep breath and let your mind go. Imagine you are a pioneer woman, captured by the Indians, bound hand and foot and taken far from home. Imagine floating in a canoe, smelling the trees, feeling the wind on your face and listening to the boat knife through the water. Around the bend the prairie spreads out in its vastness and a herd of bison grow larger. There is a white buffalo. Have you heard of it? Songbirds Are Free by P M Terrell is told from two points of view. One is Close your eyes, take a deep breath and let your mind go. Imagine you are a pioneer woman, captured by the Indians, bound hand and foot and taken far from home. Imagine floating in a canoe, smelling the trees, feeling the wind on your face and listening to the boat knife through the water. Around the bend the prairie spreads out in its vastness and a herd of bison grow larger. There is a white buffalo. Have you heard of it? 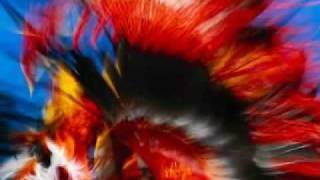 Songbirds Are Free by P M Terrell is told from two points of view. One is Mary’s, the other is Jim’s. A relative who never gives up in his search for her. Captured by Indians, Mary chose to live and wait patiently to escape, adopting the life instead of dying and her determination to survive and return to her family is amazing. 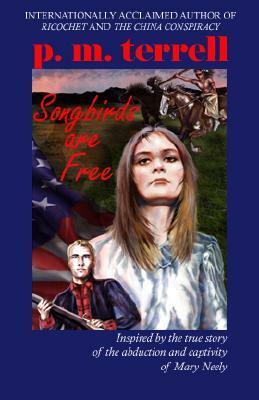 Songbirds Are Free is a piece of P M Terrell’s personal history, spiced up with her ability to write a story that will have you white knuckled, sometimes pissed off, sometimes sad, sometimes even spreading a smile or two across my face as I travel with P M Terrell in Mary’s fictional footsteps. I voluntarily reviewed a free copy of Songbirds Are Free by P M Terrell. Mary Neely is out boiling down salt at the salt lick outside of the confines of Fort Nashborough with her Dad and others out hunting. They are set upon by a small group of Shawnee Indians who scalp her dad in front of her and take her captive. It is 2 years before she finally is "free." They travel north. Through malaria infested swamp area. The British give them blankets infested with smallpox and Mary helps nurse the small tribe through and an older woman helps Mary with salve that prevents her from scarring. At one point she asks them why not just cooperate with the white men? "Which white men?" they answer. Good point. The Canadians are with the British (I think). The French? They are aligned with other Indians they are probably at odds with. The colonials? The British? At one point she gets away and the British put her in prison! They put her among hundreds of other women prisoners in the bottom of a ship which gets caught in a storm. After they land, she walks off. Be careful! Even her own white people may be enemies!! She has to head South. She eventually runs into a fictional character who saves her. Great historical story about the abduction of Mary Neely and all she went through and the faith she had during it all. Some parts were a little graphic but nothing too stomach turning.